News and Upcoming Events - Rocky Robinson The Author! It is our goal to reach that milestone in 2013 in the all Yank Shootout. 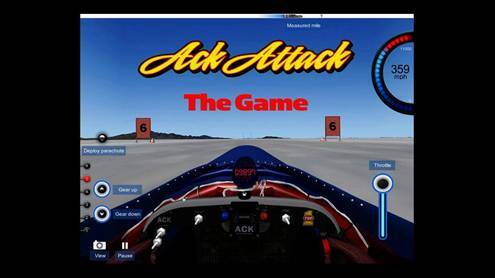 Ack Attack The Game You can download the App to your IPad from ITunes or go to http://www.top1oil.com/ and click on IPAD App. The game is a true simulation of what it’s like to drive the twin-engine turbocharged Ack Attack streamliner! From push off, through the gears, even deploying the parachute at the end of the run, it is the most realistic LSR simulation game out there. “Flat Out,” Rocky Robinson's story of his career as a land speed streamliner pilot, has been nominated for the prestigious Dean Batchelor Book Award. Established by the Motor Press Guild in 1995, the Dean Batchelor Award recognizes excellence in automotive journalism as exemplified by the man it is named after, Dean Batchelor. The Award singles out individuals demonstrating outstanding achievement in the profession of automotive journalism. It is awarded to writers judged to have produced the work which best represents the professional standards and excellence demanded by Dean Batchelor during his life as an editor, writer, and chronicler of the automotive industry. The Award was first presented posthumously to Dean Batchelor in 1995 for his seminal book on hot rodding, The American Hot Rod, which was published after his death in 1994. Below is a list of articles covering the once in a lifetime "Duel in the Desert"